For people in Lower Western and parts of Central West Slopes and Plains, South West Slopes, Riverina, Upper Western and Snowy Mountains Forecast Districts. Issued at 8:20 pm Tuesday, 6 November 2018. 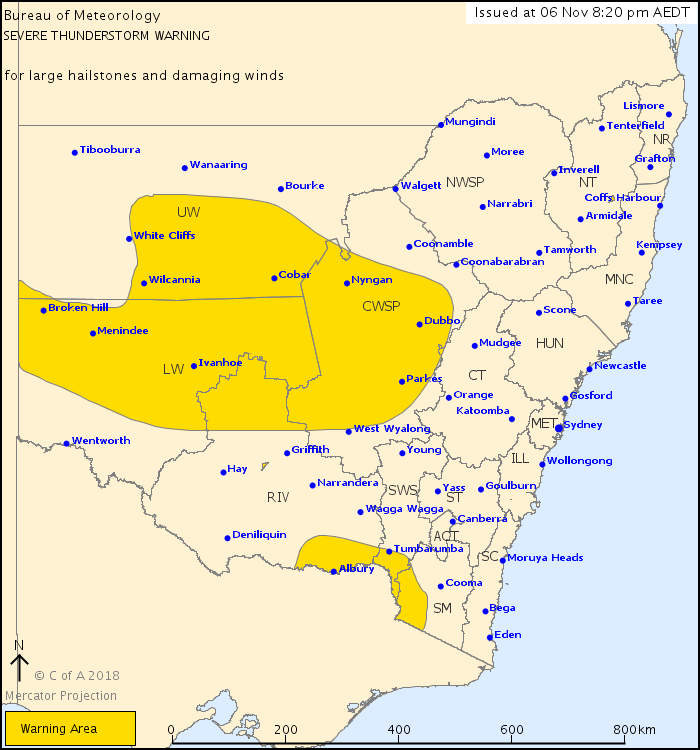 Severe thunderstorms are likely to produce damaging winds over the next several hours in the Lower Western and parts of the Central West Slopes and Plains, Riverina and Upper Western districts. Locations which may be affected include Dubbo, Parkes, Cobar, Broken Hill, Ivanhoe and Menindee. Severe thunderstorms are likely to produce large hailstones over the next several hours in parts of the South West Slopes, Riverina and Snowy Mountains districts. Locations which may be affected include Albury, Tumbarumba, Cabramurra, Khancoban, Corowa and Holbrook. Severe thunderstorms are no longer occurring in the Illawarra, Central Tablelands, Southern Tablelands and Australian Capital Territory districts and the warning for these districts is CANCELLED.